As a graduate student, Woodrow Wilson found the "specializing mania" at Johns Hopkins intolerable. But while his experience here wasn't exactly pleasant, it did produce his most famous political writing and inspire his groundbreaking ideas about academic reform. In September 1883, a 26-year-old Woodrow Wilson abandoned a short, stultifying career as a lawyer in Atlanta and entered Johns Hopkins University as a graduate student, determined to become a famous writer on constitutional history and the American government. Secretly he yearned for a career in the United States Senate, but politics required an independent fortune, which he would never enjoy — he was barely scraping by on an allowance from his father, a minister in Wilmington, North Carolina. His goal was a commanding influence in political affairs, he declared, and he was going to try to secure it through his pen, not on the stump. Academia, he supposed, would at least give him the time he needed to write influential books. Founded in 1876, Johns Hopkins was fast becoming famous among American universities for its German-inspired, research-oriented graduate program and the many PhDs it produced. 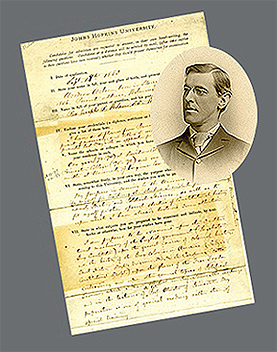 The Milton S. Eisenhower Library's Special Collections today holds Wilson's application for admission, in which he explains in his neat penmanship that his preparation was one of general reading rather than special training. He had said as much in a letter to an old Princeton friend: "My appetite is for general literature and my ambition is for writing." He did not want to become an ivory-tower researcher, but a political mover-and-shaker. He craved as broad a field of study as possible. He was about to get a very nasty shock. Hopkins was for specialists, not generalists — a fact that would make his two years in Baltimore desperately unhappy ones, as I discovered in research for my forthcoming biography of Wilson. But those years would also crystallize his thinking on key educational ideas and turn him into one of the most innovative — and controversial — men in academia. In his first semester at Hopkins, Wilson enrolled in the so-called Seminary in Historical and Political Science, housed at that time in the new JHU Biological Laboratory. The students in the seminary were witnessing the birth of a modern educational method, what we now call a seminar, symbolized by the huge rectangular table around which lectures were held during the day and the celebrated Seminary Meetings on Friday nights. In those meetings, graduate students read research papers aloud, with the lofty goal of advancing specialized human knowledge. Afterward Professor Herbert Baxter Adams would analyze the subject at length — sometimes too-great length, in Wilson's opinion. Seminary Meeting topics included the history of Spanish Florida, or the socialist experiment of Brook Farm, or, as Wilson dryly put it, "others more obscure." May 1, 1885, was typical: Adams called the meeting to order at 8:10 p.m.; 12 members gathered around the stately table, with Wilson diligently taking notes as official secretary. A student read a paper on the Puritan colony in colonial Annapolis, then Adams digressed about how the family of Mr. Johns Hopkins may have lived in that very colony. Wilson, we may imagine, stealthily glanced at his pocket watch. "I need not bore you about all this," he wrote to his fiancée in Georgia, Ellen Axson. "I am sufficiently bored for both of us." Professor Herbert Baxter Adams, standing at the podium (right), convened the famous Seminary Meetings around a huge table. Yet the impatient young man came alive when called upon to deliver papers himself. He had worked hard at Princeton and the University of Virginia Law School to polish his oratorical skills, should he ever need them in Congress. A disciple of Burke and Gladstone, no peer could match him in speechifying. I "greatly envied him," a fellow student wrote after one of Wilson's brilliant Friday night presentations. "When I got to my room, I had a very discouraged feeling." Most agonizing for Wilson at Hopkins was the specialization. The future president (1913-1921) was a man of sweeping visions — the Fourteen Points and the League of Nations culminated a lifetime of glorious daydreams — yet he was at the same time a slow reader and poor memorizer, to the point that some biographers think he might have been dyslexic. For Professor Adams' exam on colonial history (special stress on Maryland), Wilson had to memorize 2,000 minute details about the quarrels of nobody knows who with an obscure governor. "What dreary annals we have to familiarize ourselves with," he complained to Ellen. "I find the school-boy task of cramming for examination increasingly irksome. I find my interest choked by . . . the innumerable dry particulars." He wanted to fire up his fellow men in their vital public and political affairs, not live with his nose in textbooks. He could not bear the Germanic system, as he spelled out to Ellen: "It is this spirit against which I struggle. I want to be near the world. I want to know the world; to retain all my sympathy with it — even with its crudenesses. I am afraid of being made a mere student. I want to be part of the nature around me, not an outside observer of it." Wilson said privately years later (at the Paris Peace Conference of 1919) in no uncertain terms that he had always been "opposed to Germany and all that Germany represents. . . . I have always disliked German people. I have despised their educational ideas." Today, Herbert Baxter Adams is revered as the founding father of professional historians in America (he helped establish the American Historical Association) and a JHU legend. "That miserable humbug," Wilson called him in a letter home to his mother. Wilson believed that the "ignorant specialist" spent too much time burrowing into his own research, not enough in preparing pithy lectures for his students. His talks were "shams" and a "hodge-podge." Assigned readings were "trash," and his pupils were drowning in countless facts of life and science. Because his stock of ideas was small, Wilson said, Adams did not shy away from plagiarism. He grew so angry at Adams and another professor that his father had to dissuade him from fomenting a plot against these "men who are pretending to teach." Apparently the self-righteous, stymied young man was scheming to get them fired for incompetence. 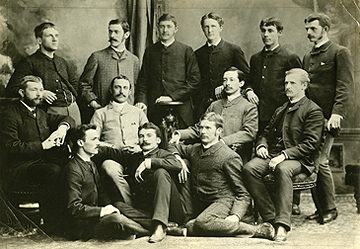 Taking time out from his busy studies, Wilson (top row, second from left) sang tenor in the Hopkins Glee Club. Adams had many devoted students over the years, but Wilson was not one of them. "I came here to admire and have remained to scoff," he told a friend during his first year. Throughout those painful months, he walked the city streets two hours a day to escape recurrent nervous headaches — already he was probably suffering from the high blood pressure that would give him a small stroke at age 39 and a much more disastrous one as U.S. president. During these meandering walks, he admired the famous sights of Baltimore (on Charles Street there were "more pretty women than I could count") and seethed against his professors' "specializing mania," how they cared only to know the precise day of the month on which Cicero cut his eye-teeth. Once he ran into a Princeton friend, Hiram Woods, who was shocked at how haggard Wilson looked — working himself to death, it seemed. Woods dragged him to an Orioles game. In fact he was working too hard. "Cramming kills me," Wilson complained again and again. He sought his father's advice — should he continue to seek the PhD even if it broke his spirits and his health? The degree meant 14,000 pages of dry reading, and he would be seeking it only for the name of the thing. Forget the PhD, his father advised, and write the kinds of books you want to — urgent manifestos on contemporary American politics. And that's exactly what Wilson did — he privately poured his energies into a book, the most important he would ever write. He pounded out Congressional Government on his Caligraph typewriter in his tiny room at Miss Jane Ashton's boardinghouse at 909 McCulloh Street a few blocks west of campus. Published in January 1885, during his second year at Hopkins, it called for an introduction of British parliamentary methods to reform Congress, so that strong leaders could emerge to guide America after years of mismanagement. This slender volume with a gilded blue cover astonished his professors and signaled to the nation Wilson's arrival as a rising star of political thought. Now Adams could not help but be impressed by Wilson's independence and drive. Although Wilson never completed the requirements for the PhD, Johns Hopkins granted him one anyway in 1886 in honor of Congressional Government, and Adams helped him get his first teaching job at a brand-new educational offshoot nicknamed "The Miss Johns Hopkins," Bryn Mawr College for women, in Pennsylvania. By the time Wilson packed his trunks, he could actually look back on his two years at Hopkins with a certain wry fondness. Things had brightened up after his book was published. Adams seemed a bit less villainous, and some other professors were downright helpful, including psychologist G. Stanley Hall, "one of the most interesting and suggestive men" at the school, with a "pleasant, straightforward, man-of-the-world's" way of teaching. Guest lecturers had been consistently inspiring, including President Charles Eliot of Harvard, editor John C. Rose of the Baltimore Sun, and essayist Charles Dudley Warner, who told young Wilson he admired Congressional Government so much, he had sent a copy to Matthew Arnold in England. The best speaker of all was red-bearded English historian James Bryce, who was both an Oxford professor and a member of the British Parliament — a dual literary/political role of the exact kind Wilson craved for himself. The strength, dash, and mastery about the man were captivating, young Wilson exulted. "He knows both what to say and how to say it. A taste of the instruction of such a man makes me all the more conscious of the insipidity of the lectures I hear daily in the classroom." Who could have imagined that Bryce would later be British ambassador in Washington when Wilson was president of the United States? At Miss Ashton's, Wilson heard stories of yet another Southerner, Walter Hines Page, who had dropped out of Hopkins, fuming about the Germanic emphasis and the specialization. Page later founded the Progressive journal World's Work, which promoted Wilson for president, and Wilson in turn would name Page ambassador to the Court of St. James. For Wilson, these friendships and connections were among the most important legacies of his time at Johns Hopkins. Wilson spent most of his pre-politics career at Princeton, first as an undergraduate, then as a professor, and finally, as its president (1902-1910). During the last of these phases, perhaps inspired by his time at Johns Hopkins, Wilson introduced extraordinary reforms, including tightening academic standards. ("This place is becoming nothing but a goddamned educational institution!" one undergraduate famously growled on his way out.) 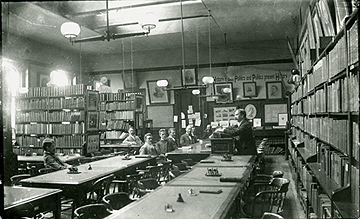 At Princeton, Wilson established the preceptorial system, whereby pupils were taught in small conferences, substantially replacing big, rowdy lectures. But it was the final phase of Wilson's reforms — his fight to make Princeton more democratic and its students much more intellectual — that turned ugly. He proposed a revolutionary "Quad Plan" in which underclassmen would live in residential, Gothic-style quadrangles alongside upperclassmen, graduate students, and faculty for what he called "mind and mind" interaction and egalitarian socializing. Quads would replace the private, elitist, and frivolous upper-class "eating clubs" that were then popular. The Quad Plan met with a firestorm of criticism — the Battle of Princeton, the newspapers called it — and was finally vetoed by the conservative plutocrats on the Board of Trustees, who were determined to protect the clubs. 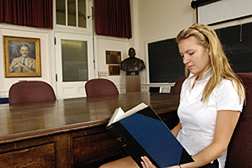 Adrienne Nolan, A&S '07, (pictured at right) reads Woodrow Wilson's Congressional Government at the famous Department of History seminar table where Wilson once sat as a graduate student. An international relations major, Nolan is kin to historian Richard Heath Dabney (1860-1947), Wilson's best friend at the University of Virginia Law School. Dabney's decision to seek a PhD in Germany helped inspire Wilson to attend graduate school, too. Because he lacked language skills, Wilson chose Johns Hopkins over Germany. In a letter to his fianc�e, Ellen Axson, Wilson explained, "Each student who is in regular standing in the department has set apart for his private use a drawer in the great table around which the Seminary meets, in which he can keep his note-books and writing materials." "My own darling," he wrote Ellen one October day, "I must write my note this morning from my place here at the 'Seminary' table in between lecture times, for want of a better place and opportunity." "Both of my parents and my older brother attended Hopkins," Nolan says. "Finding out about my connection to President Wilson through my mother's family made the place that much more special for me." The Battle of Princeton deeply wounded Wilson, and he never recovered emotionally. About to be forced out of office, he entered politics, adapting his fight for campus democracy to a national stage. In 1912, he pulled off one of the most remarkable feats in American political history: The college-professor-turned-university-president won the presidency of the United States less than two years after entering public life. Wilson (at this point governor of New Jersey) defeated not one, but two former chief executives in the "Big Three Schools" election — William Howard Taft (Yale) and Theodore Roosevelt (Harvard), the most seasoned politicians of the age. The time was right, Progressives said, for a "scholar in politics." I've tried to figure out exactly what Wilson believed about academia and which ideas fueled his reform battles at Princeton — ideas that first crystallized during his Hopkins years. He concluded that JHU students weren't trained for the real world but for the Ivory Tower, and were isolated from what he called the community at large. A true intellectual, he argued, was a man who wants to put fresh thought into the minds, and fire into the purposes, of his fellow men of the everyday world — yet at Hopkins such a person felt stifled in a thick, scientific atmosphere. What good was a graduate school if it produced only the type of intellectual who feels more at home in a library than in conversation with his carpenter? Such a person couldn't engage an eager young pupil in "mind and mind" and was ultimately unfit as an American citizen. His experience at Hopkins convinced Wilson that specialization lay at the root of most academic ills. One could pour facts into one's mind forever — Professor Adams proved that — but such information was ultimately mere lumber. Only the concept needed to be remembered, Wilson declared: "It is sheer, barren, ignorant waste of energy to try to remember a fact for its own sake. It is like eating for the sake of eating." He told Ellen he wanted to breathe fresh air, to go forth and budge the world, to inform and influence men. It stung him that the "book students" among his JHU peers scorned "students of affairs" as mere tyros. In the dim, marmoreal hush of the Peabody Library, they spent their silent weeks, not daring to step into the noisy street outside. They wrote not history but doctoral theses, he charged, and gave the world unassociated facts piled as high as the roofs of libraries. "It is sheer, barren, ignorant waste of energy to try to remember a fact for its own sake. It is like eating for the sake of eating." At Johns Hopkins, Wilson's greatest fear was that he would lose his individuality and freedom under the suffocating pedagogy of Adams. He came to define himself as Adams' exact opposite — never cold, but instead on fire with passion to lead men and achieve greatness. Aware as never before of his own "sensitive, restless, overwrought disposition," Wilson the graduate student declared that "individuality is an unquenchable fire," and in fact "sometimes it scorches and consumes." That fiery creed set the pattern for his future presidency at Princeton and beyond. And it was at Hopkins, not Princeton, that Wilson first decided that university teaching ought to be wholly reformed. As early as 1883 he posed the question that years later led to his famous "Princeton in the Nation's Service" speech and the preceptorial system he instituted there: "And how can a teacher stimulate young men to study, how can he fill them with great ideas and worthy purposes, how can he draw them out of themselves and make them to become forces in the world?" When Wilson as Princeton professor was invited back to Hopkins to teach an annual series of six-week spring courses on Administration, he did his best to exorcise the "specializing mania" of Adams. One of his students, Rockwell D. Hunt, saved his notebook from the January 1894 course, in which the charismatic Wilson, pince-nez flashing as he paced the stage, urged the students to see the broad relations of things so they could go forth to serve America. His first lecture pointedly began, "No man who knows one thing knows anything." His students at Hopkins and Princeton agreed: Wilson was a great teacher, with spellbinding oratory, a ready smile, and a bottomless supply of funny stories. In these JHU courses he helped train an extraordinary cohort of future scholars and civic leaders, including his future secretary of war, Newton D. Baker, and John H. Latane, later a distinguished historian on the Hopkins faculty. "As a youth I came under the spell of this man," Latane remembered. "His masterful personality, keen intellect, and incisive speech made a profound and lasting impression upon me." If Wilson had once recoiled from Adams as a stealer of students' ideas, he now made himself endlessly available to his own pupils both day and night, offering guidance. "Homely, solemn, young, glum, but with that fire in his face and eye," another Wilson protégé, a Midwestern graduate student named Frederick Jackson Turner, wrote to his fiancée. (Turner would go on to become one of America's greatest historians.) "If you had seen him seated on the footboard of my bed this afternoon talking the most delightful stream of anecdote and epigram to Haskins, Broughall, and myself, while we fairly shook the room with laughter, you would never have recognized him as the grave author of a book that has called out the admiration of the ablest statesmen and historians of the world." Turner added, "He is a man [of] fine thought and character, but perfectly familiar and companionable with the graduate students. I like him greatly." W. Barksdale Maynard is a lecturer in the art history departments at Johns Hopkins and Princeton. His biography of Wilson will be published by Yale in 2008.